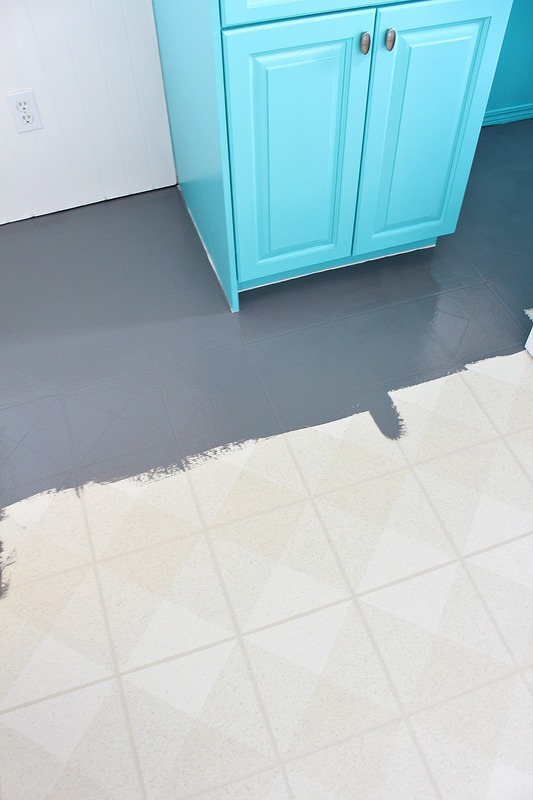 Learn how to paint a vinyl floor and update your floors inexpensively with this thorough tutorial! Painted vinyl floors really hold up, I promise. It was a cute enough pattern in a neutral, creamy hue with flecks of teal. 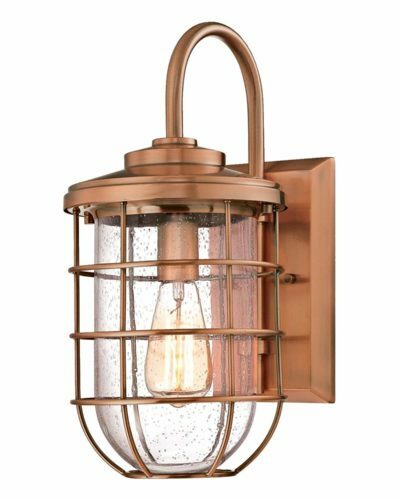 It looked okay and because it extends into the adjacent entryway, shoe closet, laundry room and powder room, we were just too lazy to replace it! It would have been one of those mushroom jobs, where you end up just gutting a room and repainting the entire house. So we left the floors. They were, however, a little grungy and dirt loved to settle in deep gauges the former owners had made. 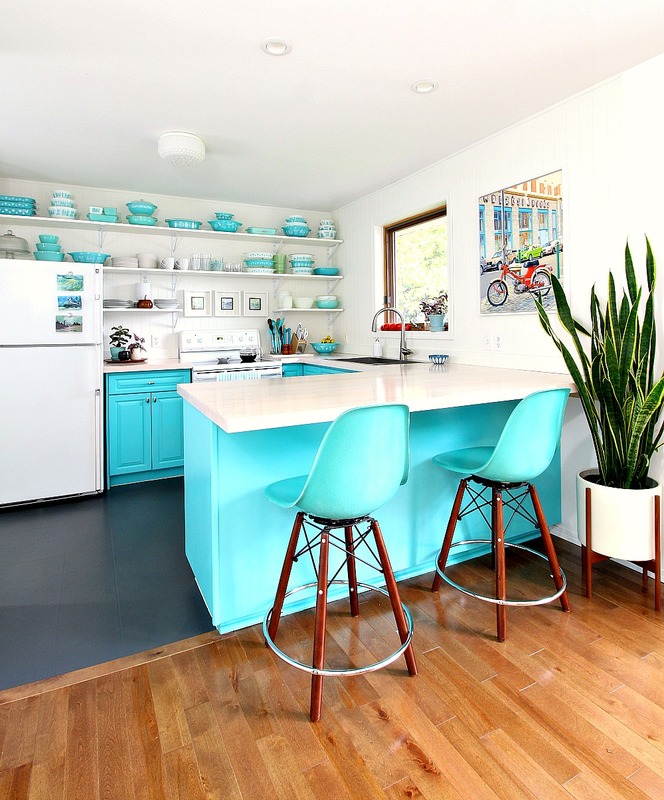 After the turquoise kitchen makeover was complete, I scrubbed the floors on my hands and knees, with a stiff bristled brush and caustic cleaner, and eventually made them look shiny and new. Fast forward exactly three days and the dirt and grime had settled in the deep scratches again. 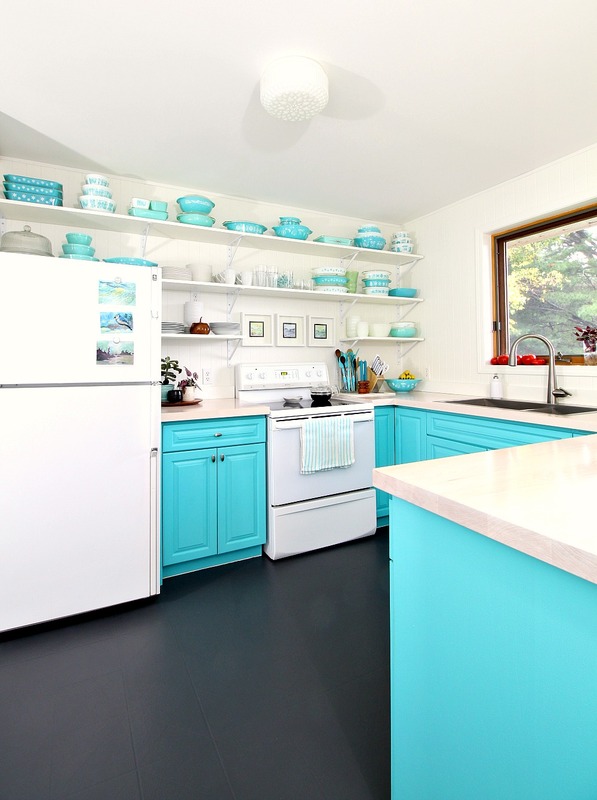 I had seen tutorials about how to paint a vinyl floor (from Designer Trapped in a Lawyer’s Body and View Along the Way), but neither of their laundry rooms seemed to be as high traffic as my space. 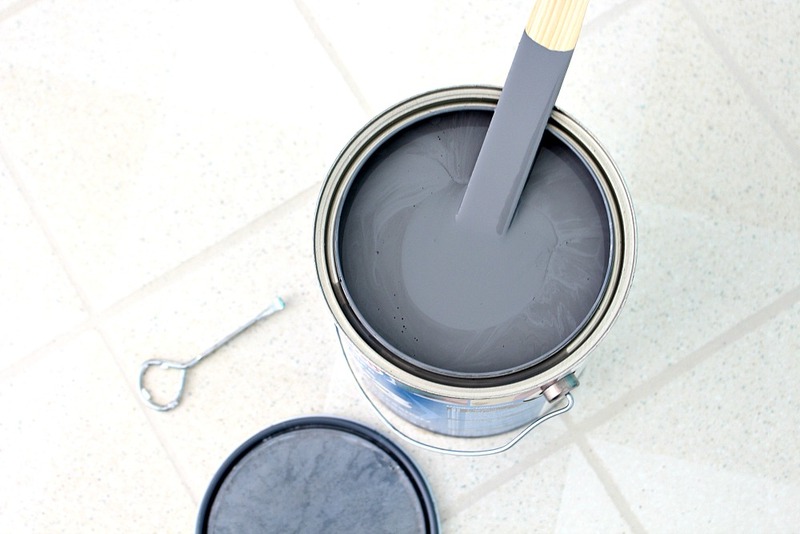 I waffled between painting and doing peel and stick – until we finished the bathroom reno. I just loved how the matte charcoal grey tiles looked and decided I wanted to test out the same look in the kitchen and adjoining rooms. Unable to find the exact peel and stick tile, I decided to take the plunge and figure out how to paint a vinyl floor, figuring that if all else fails I could still do peel and stick. I had nothing to lose! This was the plan: paint the vinyl floors a charcoal grey, then add a clear coat with fine flecks of black glitter. I was hoping the floor would look less “painted” with the flecks of glitter. I was also banking on the subtle sheen and speckles disguising crumbs and dirt. Although the painted vinyl floor turned out so beautifully, I ran into a little trouble with the glitter, thanks to the clear coat not cooperating with the paint. Luckily, I like the plain look of the painted vinyl floor anyway! 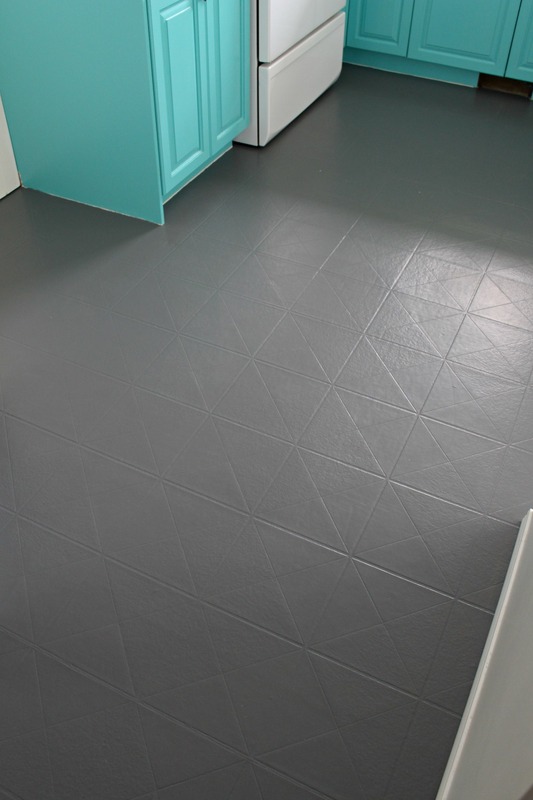 If you’ve been eyeing up an ugly vinyl floor in your house, here’s how to paint a vinyl floor – along with some tips to make painting a floor in a high traffic area (like a kitchen or entryway) a little easier. Like most DIY projects, the prep work is the most important. This will sound silly, but I spent an entire day getting the kitchen ready before we even touched the floor. I batch cooked a week’s worth of meals and stockpiled easy to re-heat grub. I washed a bunch of laundry, washed all of the dishes, emptied the dishwasher, grabbed some paper plates and the microwave from our basement and thought about how we’d live without access to the kitchen, laundry room, and front door. 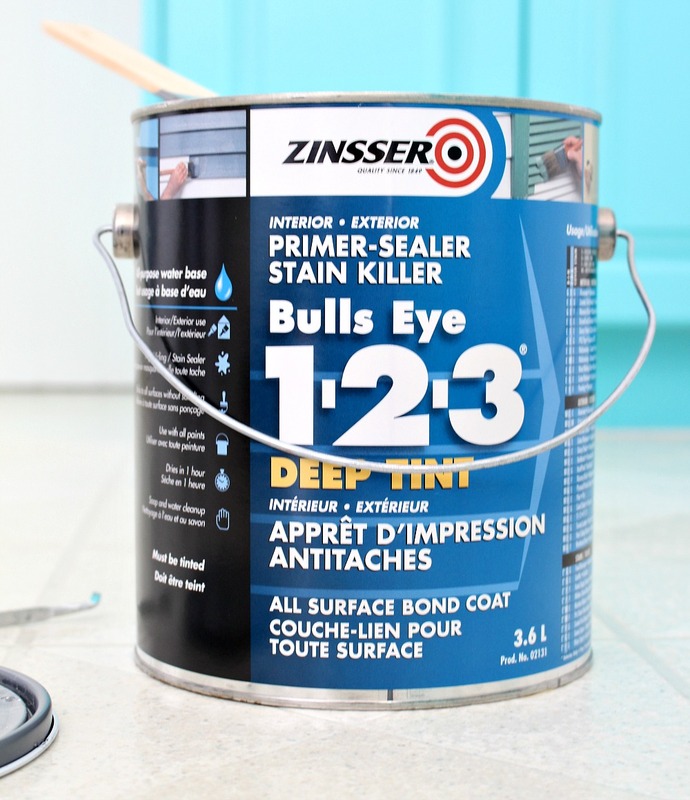 On the advice of the folks at the paint store, Hubby and I thoroughly scrubbed the floors with a stiff bristle brush and TSP, which we realized after isn’t recommended by Zinsser, but we rinsed it well and so we had no problems – but I recommend a TSP substitute. Then we scuff sanded, which didn’t really take that long. A circular sander (which we don’t have) would make light work of this task. Finally, we washed the floors once again and rinsed really, really well so no residue remained. Then we moved the appliances out of the way. Taking the time to prep the floor is the most important step in the process for how to paint a vinyl floor. We waited for the floors to dry overnight and then applied a coat of Zinsser 123 primer the next morning, which I had the store tint a dark grey. When it came time to figure out exactly how to paint a vinyl floor, we treated painting the floor a lot like painting a wall: we both edged, because it took longer, and then one of us rolled the primer on. I free-handed the edging because I knew if I taped it off, I’d surely miss places and leave a sliver of beige vinyl tile. Here’s an important tip: I kept a swiffer cloth handy and quickly wiped each area before painting, just to catch any rogue fuzzies (I caught a lot!). Any place where we primer or painted over a crumb (it happened a few times), when the crumb was finally knocked loose, we were left with a bare spot to touch up, so making sure the floor was spotless was essential to good adhesion and a nice looking paint job. Again, the prep is really the key part of how to paint vinyl floor. Once the primer had dried for 24 hours, we pushed the appliances back. The primer and paint were really similar and I was really worried the appliances would scratch up the finished paint job. After pushing everything back, we started applying the paint. 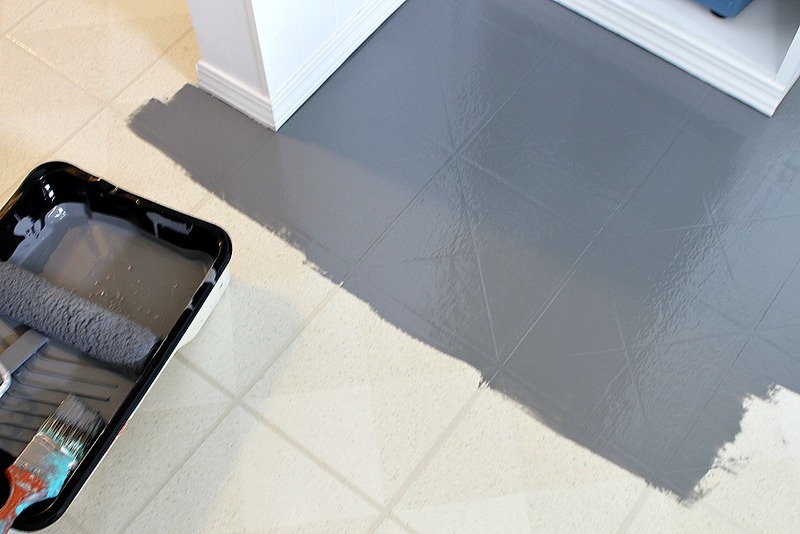 The second most important step in how to paint a vinyl floor (next to prep work) is choosing the right products because a floor takes a lot of wear and tear. 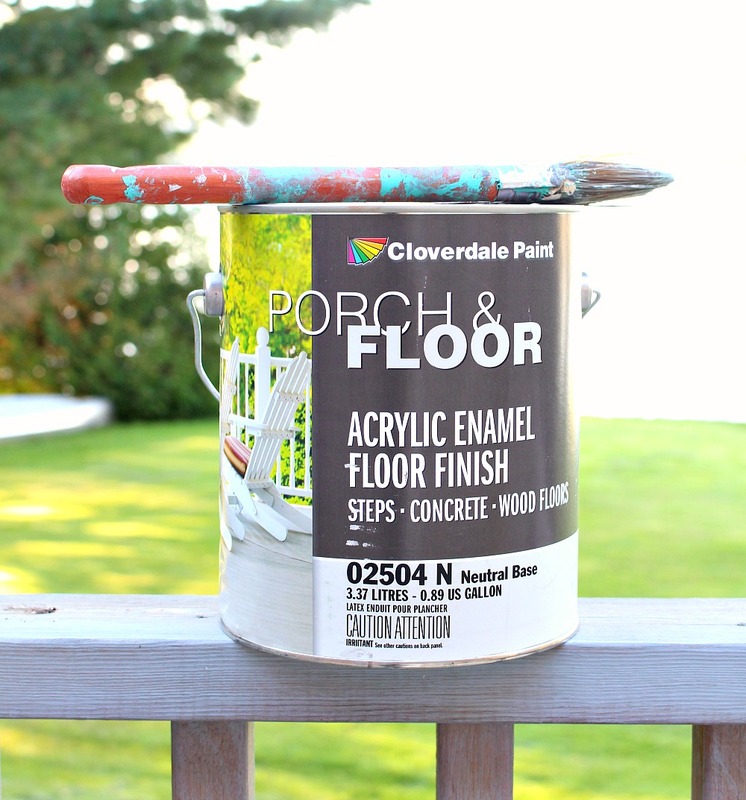 The Porch and Floor enamel we used was the same brand of Porch and Floor enamel I used for the DIY painted particle board floor I tackled (I used a different brand, but the same kind of product, for the DIY painted concrete floor in the townhouse laundry room). With the tinted primer, painting the vinyl floor went smoothly. Just like with applying the primer, we edged together and then one of us rolled again, being careful not to paint ourselves into a corner. I used a tiny brush to get in between the wall and the side of the appliances – you cannot see back there at all, anyway. One problem to watch out for: the floor enamel did not like being applied to drier areas, so we had to work quickly and keep a wet edge. We applied two coats, waiting 24 hours in between coats. We lit a fire in the fireplace on one damp evening so the house wasn’t too humid. 24 hours after the second coat, it was fine to walk on, although we were careful to only wear socks and not drop anything sharp. Szuka was banned! If you came here looking for info on how to paint a vinyl floor, that’s it! 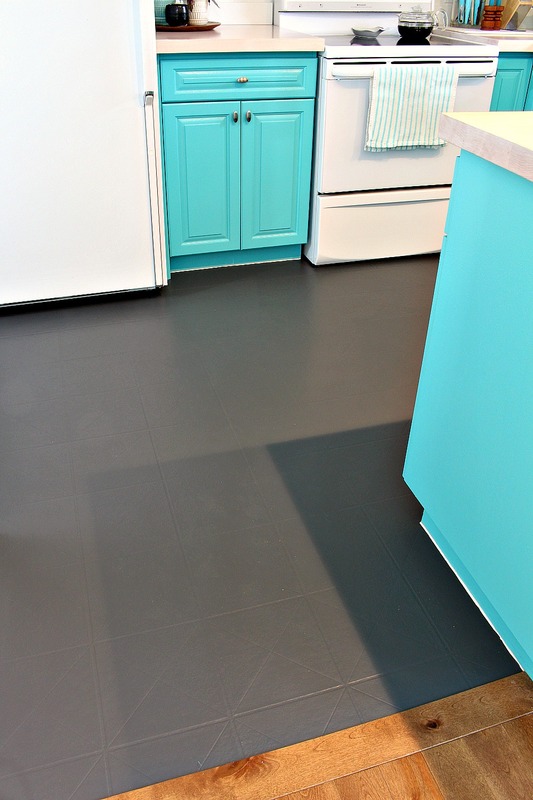 This floor has held up for years and I’m so, so happy we tried this idea because I love the look and neighbors were convinced we got new floors – no one guessed it was painted vinyl. After letting the second coat dry for 36 hours, we started with the glitter top coat. 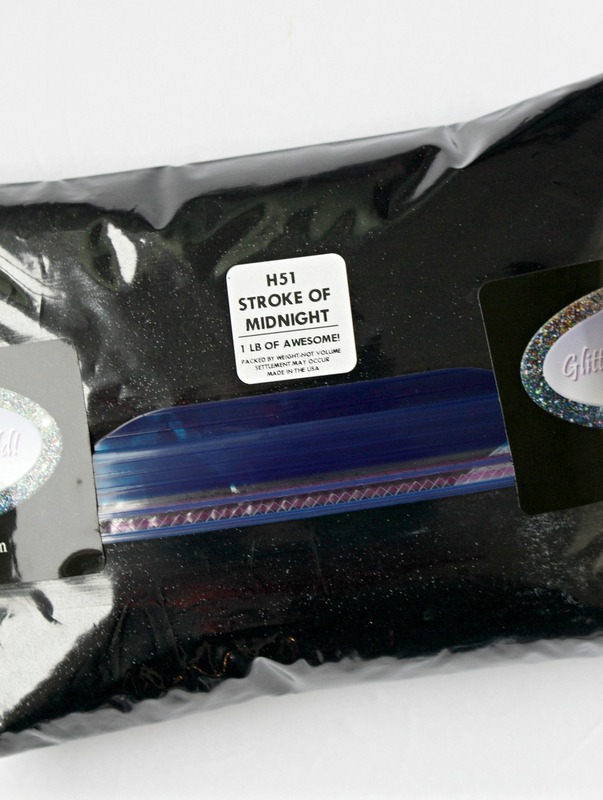 I had bought a clear coat recommended by the paint store employees and I purchased a pound of glitter. They were dubious about my painting a vinyl floor plan, so I knew I was taking a risk. I poured a third to one half of the bag into the clear coat (which I poured into a clean pail, first) and mixed really well. I brushed it onto my paint stick to get a feel for how glittery it would be, and it looked perfect! Just a hint of sparkly, not a full on glitter floor. The clear coat was milky but was supposed to dry clear. We got our supplies ready and started to apply the clear coat to the floor when we both noticed it was sort of seizing up. We quickly washed it off and ran to the garage to do some testing. Was it the glitter? The vinyl? The paint? I applied the glitter top coat to various surfaces: painted trim scraps, a stained piece of wood, the stir stick with floor paint on it. 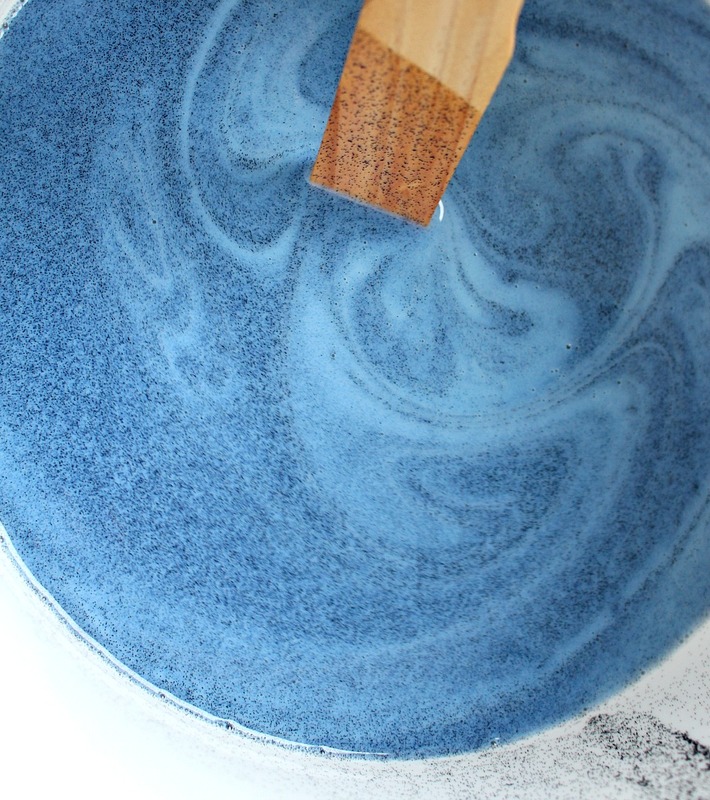 Every surface was fine (and SO pretty) except for the stir stick – the paint and clear coat were reacting. A couple of my photos have some lighter spots in them – I think my camera lens needs a cleaning, because those do not exist in real life – the floors look evenly colored. How Does a Painted Vinyl Floor Hold Up? So far (September 2018), it holds up well! Primer takes a full seven days to harden – and the paint thirty – so I kept Szuka and her claws away for awhile but she hasn’t caused any major damage. A few light scuffs to the paint but no scratches and no beige vinyl peeking through. I really like how the design of the old floor sort of peeks through. Walking on the floor feels weird, though, because it tricks my mind into thinking it’s concrete because of the texture. It’s no longer as smooth as the vinyl but it’s not rough, either – just sort of more matte, like the matte tile in the bathroom. Importantly, it swiffers really well – no issue with dust getting stuck of anything – which is such a relief! You wouldn’t guess this is a painted floor. Chat with the pros about what products to use – not all primers can withstand foot traffic, for example. Spend a few days making a list about what you’ll need from the room(s) you’re painting because it will be off limits while the paint dries. Read the can labels but don’t defer to paint store staff – do your own research too! I found a LOT of helpful stuff in some DIY forums. Don’t skip the prep work: clean, sand and prime properly for maximum adhesion. 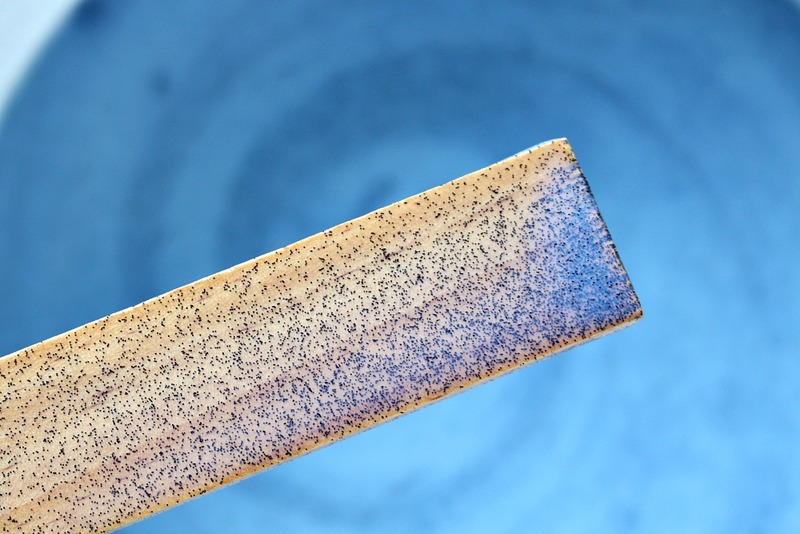 Keep a dry swiffer cloth handy to wipe each spot before applying primer and paint because little dust bunnies and flecks of stuff prevent paint from adhering properly. It looks fantastic. One of our neighbors painted their garage floor with a kit that included glitter, don't know what kit it was, but it looks great. Thanks! I'm really happy with the change. I saw a few kits online but they seemed to be for exclusive concrete use and I was really worried about sticking the paint to the vinyl. I should have been a little more brave, because it seems that proper prep and a walkable primer was all I needed for solid adhesion. I've painted concrete floors, but I had no idea you could paint vinyl. It looks great! I'm about to try stainless steel paint. Keep your fingers crossed for me. Our vintage stovetop is in great condition…except for one spot about 3" in diameter where a previous owner scrubbed it with something abrasive, probably steel wool. I thought I could live with it, but it drives me nuts. Thanks Dana! I was pretty nervous about it, especially because the folks at the paint store were really, really skeptical, but so far so good…I'm very excited to hear about how your stainless steel paint turns out – will you share the outcome on your blog? Good luck!!! I've thought about painting my laundry room floor. The vinyl flooring is in very good shape but I hate the pattern & color. It is a high traffic area as well because it's also the mud room/side entrance that we use the most. We had sheet vinyl flooring installed in all of the main living areas of our home in past few years & we absolutely love it! We chose a slate tile pattern in the kitchen, dining & bathroom & an oak plank pattern in the living room & hall. It is obvious that the oak pattern is not real wood but no more so than other manufactured wood look flooring. 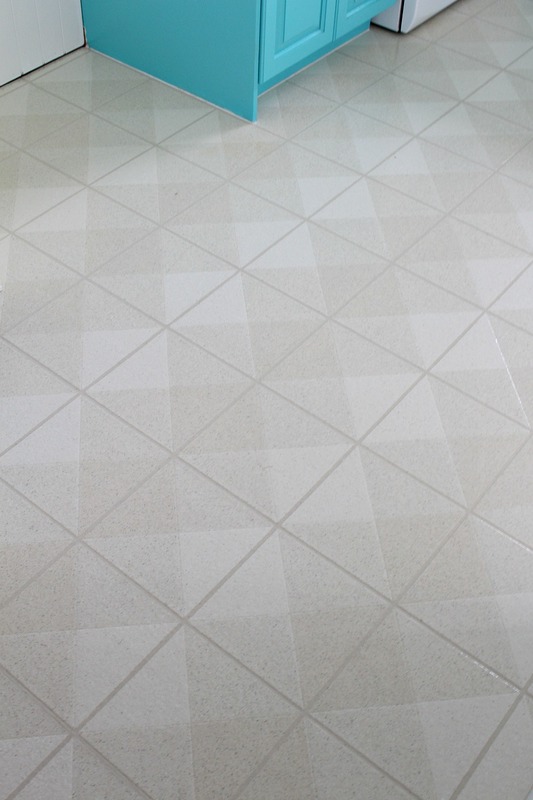 The tile pattern looks like real tile until you feel it.They are the most comfortable floors to walk on as well, super easy to keep clean & I feel safer about how soft they are compared to other floorings as I age. I also have no worries at all about water spills or leaks like I would with other floors. Eventually we'd love to replace the carpet int he bedrooms with sheet vinyl & then add an area rug. It's the cleanest flooring I've ever owned! Hi Jenny! 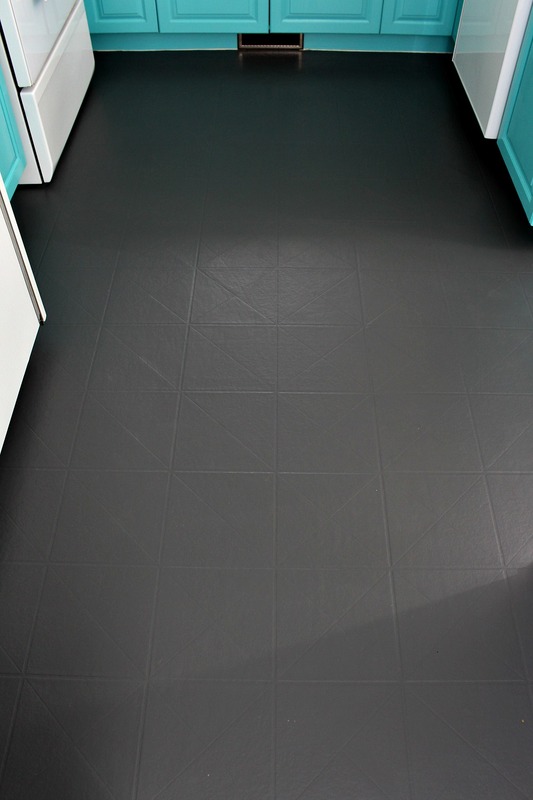 I think sheet vinyl flooring is seriously underrated. We installed it in the bathroom in our last house and nobody guessed it was vinyl. I agree totally that it's easy to clean (no grout lines! ), easy to walk on, and some vinyl out there looks really, really good – yours sounds gorgeous! And I'm sure it was as easy on the wallet as it is the eyes. 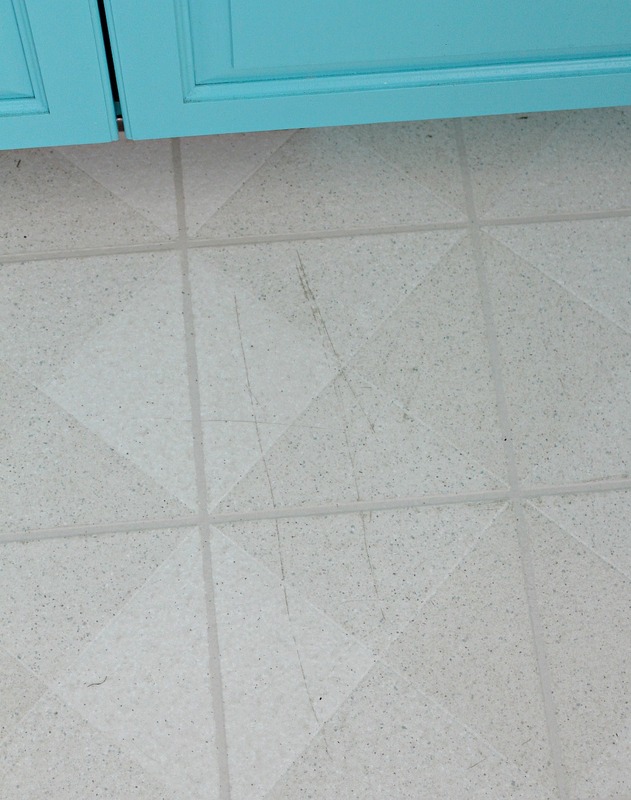 Plus it doesn't chip and crack the way tile can (although scratches and gauges have been an issue for me – but no more than the hardwood, which is scratched like crazy).If you paint your laundry room vinyl, let me know how it goes! 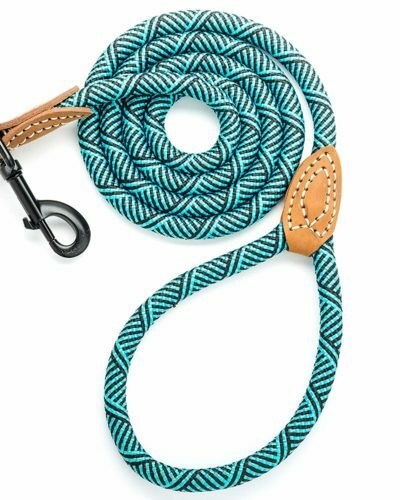 Other folks have done stripes and stencils, so there are a ton of options. 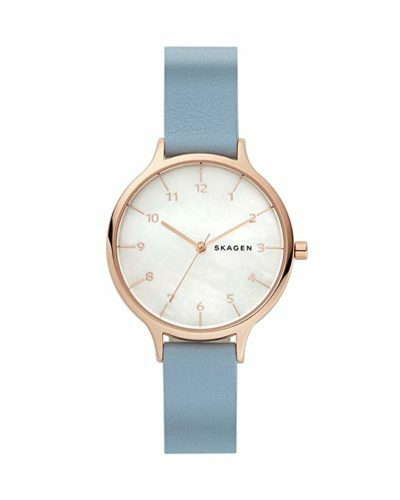 I just like the solid color because it looks less painted, somehow… But that might be in my mind, haha. 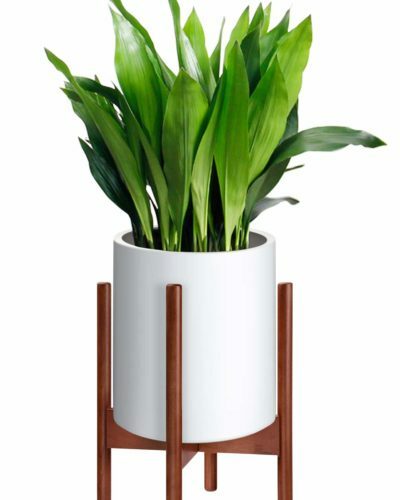 Wow, that really looks great. I really love the dark grey. 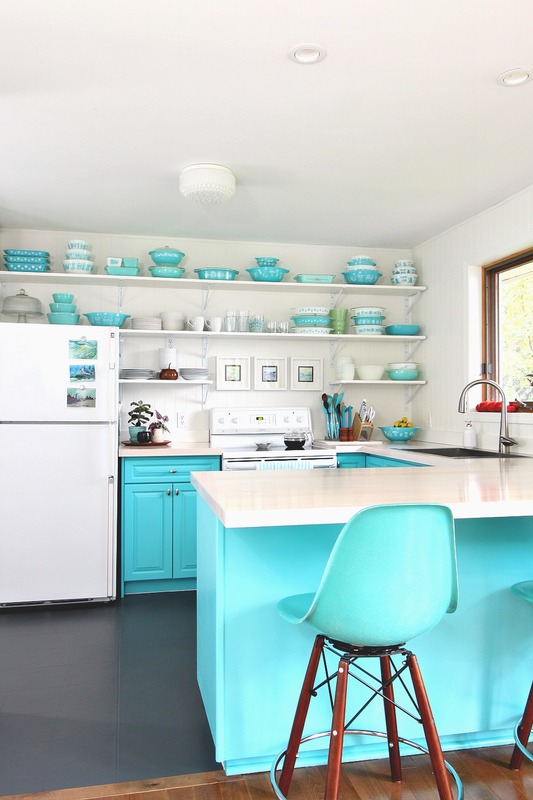 I love your floors, and kitchen! I am about to paint my particle board floors in the living room, as well as vinyl floors in the kitchen. 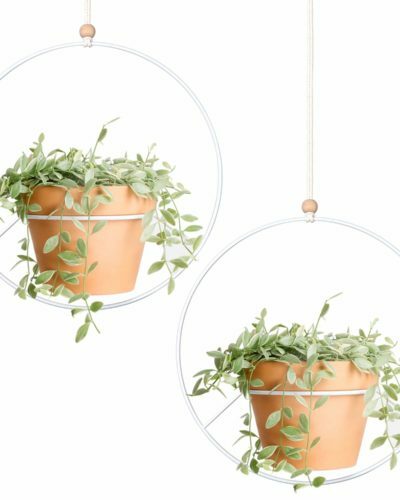 This so inspires me to keep having wonderful, money saving ideas! Everyone I know keeps telling me that painting the kitchen floor, and the particle board floor in the living room, will not work. They have also said that I am crazy for thinking about it. Well, I am going to show them the pics of your kitchen floors, and the pics of the pb floor at the building that you rented several years ago. Thank you so much for the encouragement and drive! Would love to know how the floor is holding up. I am SO thrilled with it!! Even 100+ pound Szuka hasn't been able to ruin it. It looks amazing even after muddy boots and dog paws. There's a few slight surface scratches, but the top coat of our hardwood floors have them too. No scuffs through the paint at all, it looks freshly painted but if you crouch a certain way you can see those light scuffs. Seriously I'm so impressed with the paint!! Thank you for the great tutorial. I'm making over our guest/kids bathroom and the vinyl floor is a scuffed up awful cream color that brings the bathroom look down. 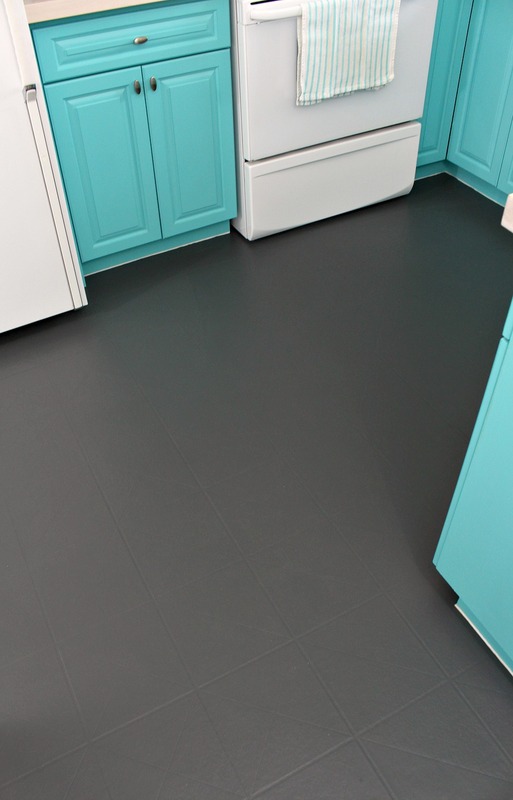 I was wanting to change it to dark grey….I love the color of your kitchen floor. After reading this, I'm feeling brave enough to tackle this project! Thanks so much! I'm so happy to hear you feel emboldened to try – let me know how it goes! Great looking reno! I’m curious what type of clear coat you used that seized up so I know what NOT to use with an acrylic floor paint. Thanks! Good question! I’m sorry I don’t remember but I will say it doesn’t need a top coat! It has held up beautifully. 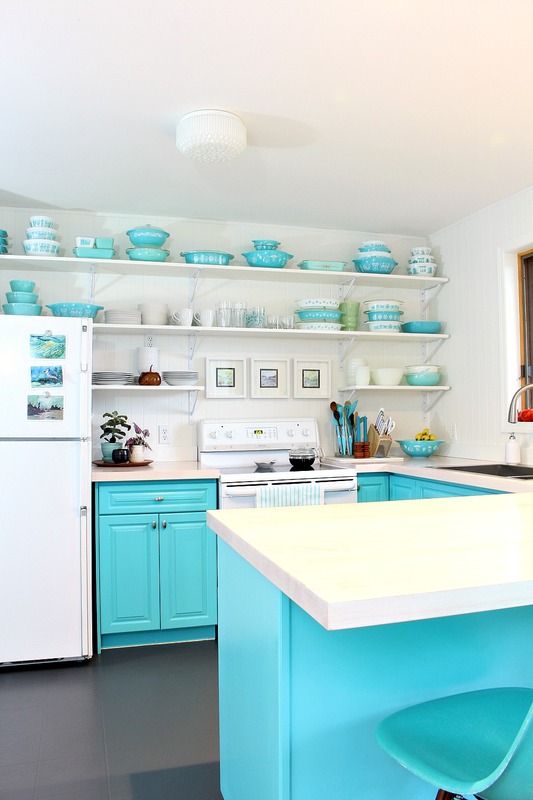 Your kitchen is absolutely adorable!!! I love it. I just painted the vinyl floor in my bathroom today. Hoping it turns out as cute as yours did! Thank you so much! I’m so excited you painted your bathroom floor. I hope it turns out great to – although I’m sure it will. What color/pattern did you go with? I see where your vinyl floor looks solid, and everywhere I look they have solid vinyl floors, what I need to know is will this work on peel and stick vinyl floors? Mine is so ugly and old but I can’t afford a new floor. What do you think? Hi Sonja, I don’t see peel and stick vinyl floors behaving too differently in terms of painting them. At first I was thinking that the only risk could potentially be paint seeping between the seams and lifting tiles. It’s possible paint could loosen the adhesive? That’s a big question mark – but with projects like this, there’s always a tiny risk. But there were no issues where my sheets of vinyl have seams. I’ve been wracking my brain but I can’t see this not working. The paint I used isn’t designed for a certain kind of flooring – I’ve painted chip board floor too. As long as you clean it well, sand/scuff well and use a good primer, you should be able to paint your peel and stick floor. 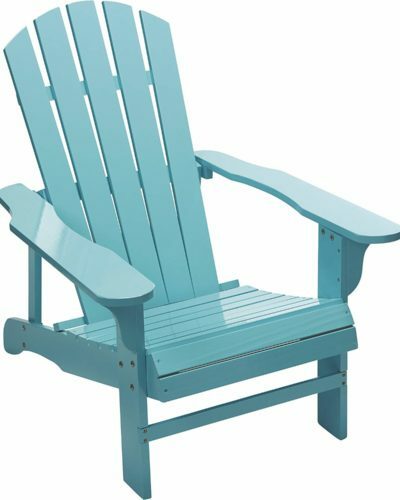 I would maybe just apply a few thin coats to keep paint from really seeping in – it might take you a little extra time. Good luck 🙂 I know what it’s like to have ugly vinyl floors and no money to replace them! I am in the process of painting our bathroom vinyl. Did you do one coat of printer, one coat of paint and one coat of enamel?